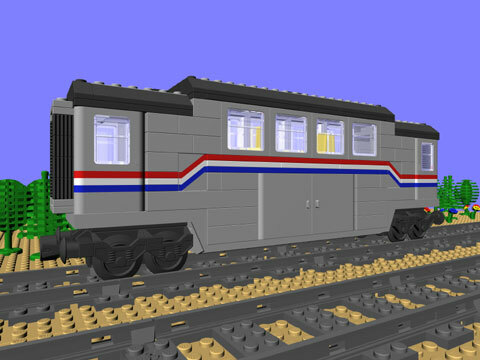 With the re-release of the MetrolinerM as a LEGO Legend it is now a little easier to build additional cars for this classic train. Parts are readily available again and the CTB-1128 Baggage Car is the third in a series of Metroliner add-on cars. The CTB-1128 Baggage Car is a long (34 studs) four axle piece of rolling stock. Based on the wagon plate from the Lego Legend 4547 Club Car or 10002 Club Car. CTB-1128 extends the Metroliner and adds variety to your train. This model uses a number of pieces which may be hard to find, notably the light grey panel doors and black 2×6 slopes. In the original Metroliner the doors were printed with red, white, and blue stripes. In the re-release the stripes are added with a sticker. CTB-1128 requires the unprinted version of the door. Printed and bound instructions for CTB-1128 are available for purchase on Bricklink. and the yellow trainstation with my grandchildren. Bought them when my sons were kids back in the early 90’s. Hope you can help me find these instructions. There are a couple of instuctions web site and LEGO has put some PDFs up for old sets. I usually look on LEGO Service first and if I can’t find them there, I go to Peeron.